Periodontal (gum) disease is caused by a build-up of bacteria on the teeth and gums. This means that a good oral hygiene routine, including regular dental appointments and thorough brushing and flossing, is the best way to prevent it. Periodontal disease is caused when the bacteria in plaque builds up between the gums and teeth, causing the gums to become infected. Left untreated, this infection can cause the gums and the supporting bone structure to deteriorate. This can also lead to gum recession and tooth loss. 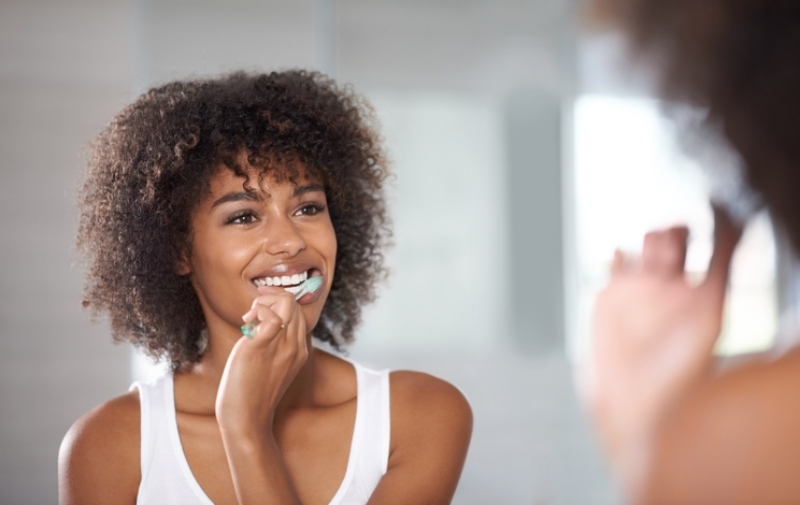 Luckily, it’s quite easy to prevent this process from beginning in the first place – it’s all a question of maintaining healthy oral hygiene habits. What does a healthy oral hygiene routine involve? It’s important to brush your teeth at least two times a day, for two minutes each time. For an added benefit, it can help to brush after your mid-day meal as well. Be sure to spend the full two minutes brushing all the exposed surfaces of your teeth: the front (facing out), the back (facing in) and the chewing surfaces. It can help to mentally divide your mouth into quadrants (upper left, upper right, bottom left, bottom right) and spend about 30 seconds brushing the teeth in each quadrant. Hold your toothbrush at a 45 degree angle and brush in gentle circular motions. Your toothbrush can’t reach the surfaces between two teeth, and for this reason, it’s also important to floss every day as well. Once daily before bed will suffice for most people, though adding in another session after lunch can be beneficial. When flossing, hold the dental floss taut, and insert the floss between two teeth. Move the floss gently up and down the side of one of the teeth, and then the other, forming a c-shape with the floss. Continue this process until you’ve flossed between all your teeth. Swish with mouthwash for about 30 seconds to a minute after you’re finished brushing and flossing, ideally before bed time. Mouthwash will help remove any remaining food particles and plaque that were missed during brushing and flossing. Swish the mouthwash all around your mouth for the allotted time and then spit it out. Be sure to visit your dentist at least twice a year (or as prescribed) for a dental examination and cleaning. Your dentist and dental hygienist have cleaning tools that allows them to more thoroughly clean your teeth that you’re able to at home. They also have the knowledge, tools and expertise to spot developing oral health issues that you may not notice. Schedule a yearly comprehensive periodontal evaluation (CPE) with a periodontist. During a CPE, the periodontist will look at your teeth, plaque levels, bite, bone structure, and of course your gums, and evaluate your risk factors for gum disease. Eating a healthy diet high in nutrients and low in sugars and starches is just as good for the health of your teeth and gums as it is for the rest of your body. Cutting back on sugars and starches is particularly important because those are what oral bacteria thrive on! If you are struggling to eat a sufficiently nutritious diet, consider consulting a registered dietitian (RD). If you can maintain the above oral health habits, you can significantly lower or even eliminate your risk of developing gum disease and keep your smile healthy and happy! Interested in booking a comprehensive periodontal evaluation? Contact our Lethbridge office today!